You have succeeded in helping Steve accomplish his adventure in Minecraft world, and you have got many experienced while exploring this world. You know which traps can knock creepers out, how much a trap is, how many blocks to craft an item, or which tasks should be done first. You remember each corner of each Minecraft game. When the screen shows the beginning of one game, you know what the name of the game is. Why do not you take part in The Minecraft Quiz 3? Answering right all questions in the quiz proves that you have known Minecraft a lot. The quiz is very interesting and plenty of players love it. Three possible options are for each question. The type of question may be yes/no, or it asks players to the recipe to craft an item. You gain one point for a right answer. If one answer is not right, you have two choices either starting the game again or keeping on the game without gaining one point. There is one question bringing 5 points to you and it appears after 10 questions. 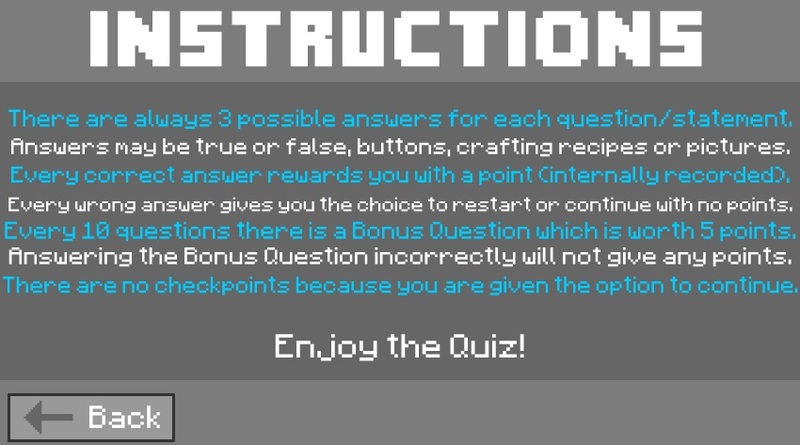 Different from quiz number 1 and 2, no checkpoints are in The Minecraft Quiz 3. – You click into the answer you think right.